LENTZ RESURGENT GRAINS now offer the world’s most wunderbar ancient grain taste, namely Grünkern. It’s grown and smoked for us in the Bauland region of Germany, where Grünkern is a major traditional food making a come-back. 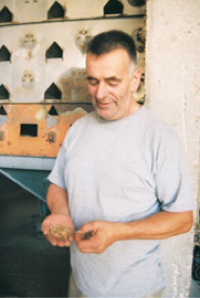 Grünkern means Green-Kernel: Spelt, Triticum spelta, is harvested green in the dough stage of ripening. One aspect of maturing cereal grains is a plant process that changes the sugars of the growing stage, to carbohydrates in ripe grain. (This is just the opposite of fruits like apple, there the carbohydrates of the growing stage change to sugars when ripening.) 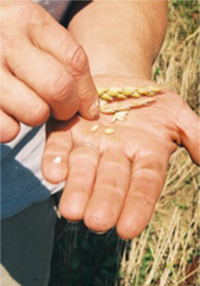 By harvesting Spelt green, some of the growing-stage sugars are captured – Grünkern flavor surprises the palate with its hints of sweetness. Green grain is too wet to store at 40 to 50 percent moisture. Reducing moisture to the storable 10 to 12 percent does not happen by normal drying, however. Instead the Grünkern is smoked at 320 degrees to 400 degrees Fahrenheit over oak and beech fire; these hardwoods are chosen because they impart an excellent smoky taste to the product. Per 11-cubic-yard batch it takes four to six hours of burning wood, the Grünkern continuously turned in modern machines designed for just this purpose. Even today it’s round-the-clock work, despite the machines; yesteryear the green grain had to be turned by hand, shovel-full by shovel-full, in square open-sided buildings called Darren. To this day you can see an old Darre in many a Bauland village – a bucolic sight from slow-life eras. Dehulling the Grünkern is the same impact process as dehulling ripened Spelt, which is called Dinkel in these parts. It’s a mystery why Bauland farmers turned to Grünkern production those hundreds of years ago, and why Middle East peoples had the same idea, their smoked green grain being durum, the product Frikeh. Today’s growers take a guess: Grünkern production stretches the harvest; an earlier start meant less risks to the food supply, the Bauland a region where summer lightening storms occur frequently. 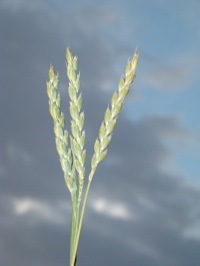 The resurgence of Grünkern followed the resurgence of Spelt in Germany. In recent years Grünkern gets exported to Switzerland, Holland, Belgium, and also to Italy where the Slow Food organization is promoting it. About 90 percent of Grünkern sales are to firms that process it; a lot is used in soups, some goes for making Bratlinge (vegetarian Hamburgers), and some is used as flour by bakeries. Grünkern is a real health food with a lot higher nutritional value than rice – 12 grams protein, 2.7 grams fatty acid, 63 grams carbohydrates, 9 grams fiber, plus a whole host of minerals in a 100-gram serving. Chefs love the stuff cooked like risotto, the combination sweetness and smoked flavor a pure delight. Yes, Lentz Grünkern is the most gourmet cereal grain in the world.